Published by Mystic Seaport, Mystic, Connecticut. Hardbound and highly illustrated in full color. Order online from Mystic Seaport or phone toll free at 800-248-1066. This book offers a glimpse into American life at the turn of the last century. The story is told not in words but through paintings that illustrate some of the country’s most memorable places and suggest what life there was like more than a hundred years ago. 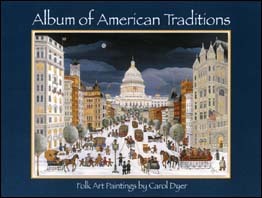 Popular folk artist Carol Dyer here describes the inspirations and techniques that make her colorful paintings so engaging. Divided into sections celebrating American port cities, the splendor of Washington, D.C., the charm of Annapolis, Maryland, and the spirit of the seasons, this charming work will delight anyone with a taste for folk art.